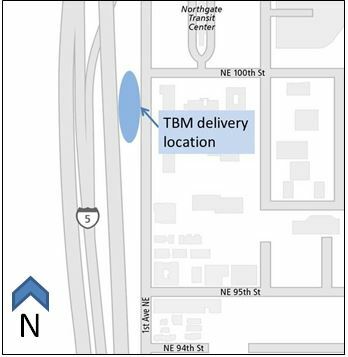 Construction crews working to build the Northgate Link Extension for Sound Transit will be making an early morning equipment delivery to the Maple Leaf Portal site. The delivery may cause some noise. Two large sections of a tunnel boring machine will be unloaded at the former North Seattle’s Park-and-Ride south lot early in the morning on Saturday, Dec. 14 and again on Sunday, Dec. 15. Crews expect the delivery to arrive at approximately 5 a.m. each morning. Nearby residents may hear continuously running engines while crews use a crane to unload the TBM segments from over-sized trucks. The work is expected to take about 3 hours each morning.